"This recipe really has a zing to it!" Soak frozen peas in a pot of hot water until heated through. 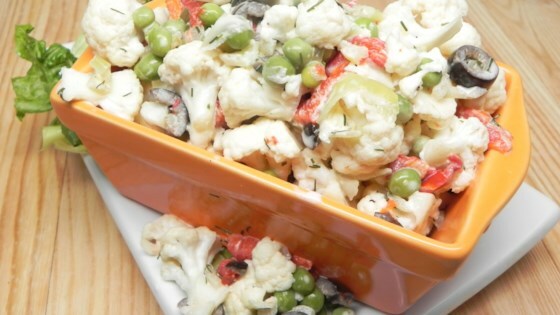 Combine cauliflower, mayonnaise, vinegar, relish, banana pepper juice, sweet peppers, olives, banana peppers, black pepper, dill, and peas in a bowl. Refrigerate to meld flavors, at least 1 hour. You can also use dill pickle juice instead of banana pepper juice.